Man’s best friend needs a stimulating outing, too! Seek out these great dog parks in Connecticut to spend some quality time playing with your pup and to get some fresh air for yourself. The best part? Allow your dog to run leash free in all the parks included on this list! Keep your eyes open for a dog statue and once you spot it, you’ll know you’ve reached the Shelton Dog Park. Consisting of two fenced in areas for dogs (one for small dogs and one for all dogs) and a four-mile-long dog-friendly walking trail, this is a great park to bring Spot for some exercise. The Middlefield Dog Park was created by a local Boy Scout for his Eagle Scout project. Located in the 75-acre King Property on Beseck Mountain, this fenced in dog park welcomes owners and leash-free dogs. The dog park is approximately one acre of wooded and grassy land and consists of two fenced areas, one for smaller or shy dogs and one for all dogs. The Rocky Hill Dog Park welcomes well-behaved dogs accompanied by their owners to their clean, safe, and fun environment. The dog park is a grassy, fenced in area meant to let dogs run free, exercise, and play with other dogs. Keep in mind that the Rocky Hill Dog Park has several official rules meant to keep dogs and visitors safe, so do be sure to check their website before planning a visit. Open for approximately seven years, the South Windsor Bark Park features two enclosures (one for small dogs and one for all dogs), fresh water, cleanup stations, and play equipment. This dog park welcomes behaved, off-leash dogs to play. Owners are encouraged to keep their dogs on-leash outside of the dog park. The Enfield Dog Park consists of two fenced-in enclosures with woodchips on the ground. Scattered trees provide some shade and drinking water is available seasonally for dogs. The Enfield Dog Park is a 501(c) 3 non-profit composed of volunteers who love dogs and want a safe place for them to play outdoors. Check the dog park’s website for visiting rules. This huge, 14-acre dog park consists of an open field, walking paths, a river (a portion of the Pomperaug River), and an enclosure for small dogs under 25 pounds. There are also trash bins and dispensers for dog waste bags to keep the park clean. The Southbury Dog Park is open 365 days a year from sunrise until sunset. The Bark Park Dog Park, located on Prospect Ridge Road, has two full fenced in areas consisting of an area for small dogs and for all dogs. Additionally, this park features drinking water and toys for dogs and benches for their owners. Central Bark is a great place for dogs of all sizes to get some exercise and spend time in fresh air. Well-behaved, vaccinated dogs are welcome to play in the two enclosures available for small dogs under 25 pounds and large dogs over 25 pounds. Central Bark is open daily from sunrise to sunset. 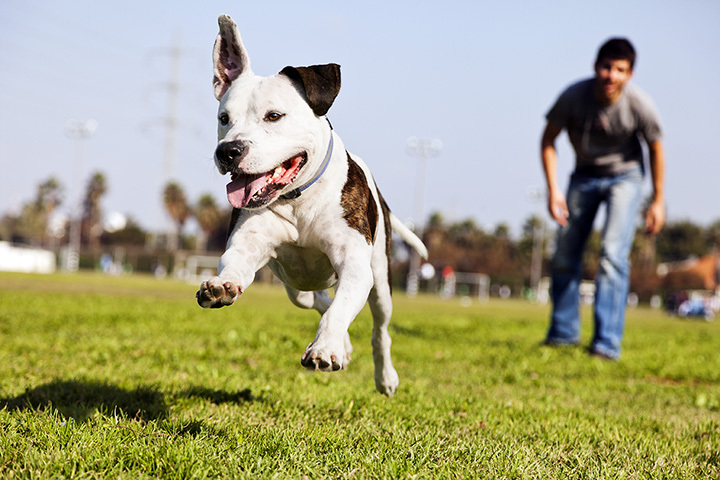 Let your dog play catch and run free with other friendly dogs at the Newton Park and Bark. The park consists of two acres to allow plenty of space for dogs to chase their tails. Their most popular event is the annual Howl-o-ween party with games and costume contests to raise money for the park. The Stamford dog park is run and maintained by volunteers. It features a spacious large dog area and a smaller area for small dogs to play. Additionally, there are restrooms, a parking area, and a water and trash station for dogs. The park is shaded by numerous trees, making this a great place to relax with your pup. View more Connecticut Dog Parks.